I just received this email from Gudrun Schwartz - who runs the Albert Lee forum on MSN. Should be well worth a listen. I can't promise anything but I will have a go at recording it. Thanks Gudrun - you are a star! Hello Alan, I thought this might be of interest to some of you. Best wishes for a good, healthy and rocking NEW YEAR. Gudrun from Berlin. Just in from ELIO PACE, please feel free to forward or post wherever you think it’s helpful; Albert Lee Documentary on National Danish Radio P4 - NEW YEARS DAYþ I wanted to let you know that Danish national radio is transmitting a 1-hour documentary on Albert on New Year’s Day. It’s going out from 3 - 4 pm UK time (d.h. 2 - 3 pm CET). I thought you would like to know and that you would like to inform as many of the fans as possible via your websites and forums. These are the instructions I was given; Go to www.dr.dk/netradio/ then click on the grey P4 button - and then when the available stations come up, click on P4 Syd or Esbjerg or Midt&Vest. I received this email from Dave (Holly) Holland a couple of weeks ago. 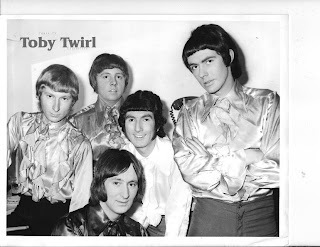 Dave was the lead singer with Toby Twirl during the late sixties - a group whose name still pops up often on the VSL site. Hi its Dave Holland, Holly the lead singer from Toby Twirl. I was recently in contact with John Reed the drummer and said I would like to keep in touch with all the great people and friends from the 60’s and 70’s . I am currently the manager of the JOINERS ARMS pub in Blyth and have had many visits from lots of people from the great days of old. It would be great if lots of people from the era of The Cellar jazz club. Latino’s , Wetheralls, La Dolcie, The Gogo Downbeat, and many other clubs could meet up and share the great memories of that time. So, if you are in the Blyth area at anytime, why not give Dave a shout at the Joiner's Arms. Well it was a week ago when we were in Tudhoe and I have to say all three of us were knocked out with event. You can't beat LIVE MUSIC. I was pleased that we had the opportunity to introduce ourselves to you, considering your gruelling timetable as musician, entertainer and compere. I have to take my hat off to you, Alan Leightell and all the 'Regulars' that have made Vintage Sixties Live such a temendous success. I can only imagine the effort, time and sheer dedication you all must devote. And when you see such an enthusiastic crowd every month it must all feel worthwhile. I only wish I lived closer, I'd be there every month. I get back 'Up North' a couple of times a year and you can imagine that I will now coincide my visits with the second Thursday in the month. Have a great session on the the 11th December, please keep the video's coming on the website. I need them to get a 'fix' until the next visit. Thought you might find this website of interest. Amazing that an American has put it together. Have a great Christmas and all the Very Best to everyone for 2009. We'd be happy to welcome you and the lads again anytime Pete. The site he refers to is well worth a look. Ernie also played bass with the Toy Dolls for a while - notably on their smash hit Nellie the Elephant - which currently has almost a million hits on You Tube alone. Olga sends his best wishes and congratulations on our web site. The Toy Dolls are still playing to packed houses especially in Europe and the Far East, where they are massive - but you would expect no less from a band whose set list varies from "Nellie" to "Sabre Dance". Hopefully, we can look forward to a visit to one of our club nights when their busy schedule allows. In the meantime I will be delighted to add Olga to our Celebrity Friends. You could also search for Toy Dolls on You Tube for action packed stage performances - but I must warn you - I was knackered just watching the clips.